“Really?! I don’t HAVE to buy grass-fed beef? !” This A-HA moment is one of my favorites to share with clients, friends, and family alike. True, all beef is nutritious and delicious, whether it be grain-finished or grass-fed. And yet, with the wealth of misinformation surrounding the two, you’ve been led to believe otherwise. Here’s the low-down. Yes - you read that correctly. All cattle, regardless of the finishing stage, graze on pasture grass for much of their lifecycle. I’ve had the opportunity to visit several farms and see this up close and personal, most recently on a tour in Kentucky (sponsored by their local beef council and the Northeast Beef Promotion Initiative). The difference? Whether cattle are grain-finished or grass-finished during the last four to six months of their lifecycle. Using the average slaughter age of 18 months, grain-finished cattle spend anywhere from 66-75% of their lives grazing on grass. You many have heard that grass-finished beef is more nutritious than its grain-finished counterpart. While grass-finished beef does indeed contain more omega-3 fatty acids, the difference is statistically - and nutritiously - insignificant. One serving of grass-finished beef contains 0.05g omega-3 fatty acids, vs. 0.02g in grain-finished. Technically, grass-finished contains twice the amount of omega-3s as grain-finished, but the difference is, literally, 30 milligrams. Consider this: a serving of salmon provides approximately 1500 milligrams omega-3 fatty acids. The takeaway? Whether grain-finished or grass-finished, enjoy beef for its big ten nutrients, and have a piece of salmon if it’s omega-3s you’re after. Whether grain-finished or grass-finished, beef delivers a nutritious punch. The reason here is two-fold: cattle that are finished on grain gain weight more quickly than cattle that spend their entire lifecycle grazing in pasture. Less time getting ready for market equals reduced usage of natural resources! And speaking of natural resources, grain-finished cattle are able to utilize feedstuffs that are inedible to humans. A perfect example is distillers’ grains! I recently visited the Lexington Brewing and Distilling Company, where ranchers are invited to pick up this nutrient-dense cattle feed - free of charge! No wonder the cows in Kentucky are so happy - I’ve been told that distillers’ grains are like candy to cattle. After being utilized for the distillation of bourbon, these various grains will be upcycled by cattle - and made into beef! 1) Much of the land utilized for cattle production is unsuitable for other agriculture. Take a look at this map! 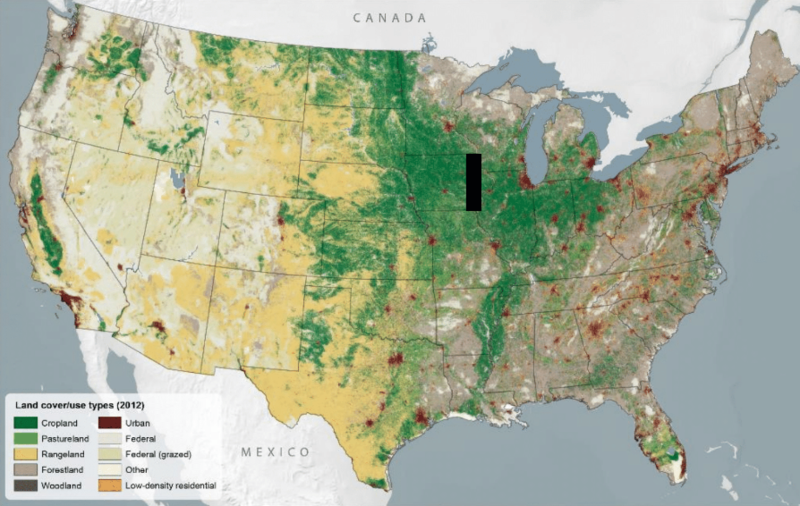 Note the black box is a representation of the amount of cropland utilized for growth of all cattle feed. 2) This is assuming all animals used for consumption would somehow magically disappear, doesn’t account for the potential environmental impact of manufacturing plant-based proteins, and doesn’t factor in the necessity of cattle for vegans. No cattle = no manure = depleted soil quality. 3) As of now, beef production accounts for only two percent of total greenhouse gas emissions in the United States. By comparison, transportation accounts for 25%. I’d advise you to worry less about your beef consumption - whether it be grain-finished or grass-finished - and take some time to rethink time spent in transit. Back to the specific benefits of grain-finished beef: these cattle actually produce less methane (cow burps, not farts!) therefor contributing less to green house gas emissions and carrying a lighter carbon footprint. I personally prefer the flavor profile of grain-finished beef. What’s yours? Tell me in the comments below! Enjoy your beef – grass-finished OR grain-finished. Enjoy your life!